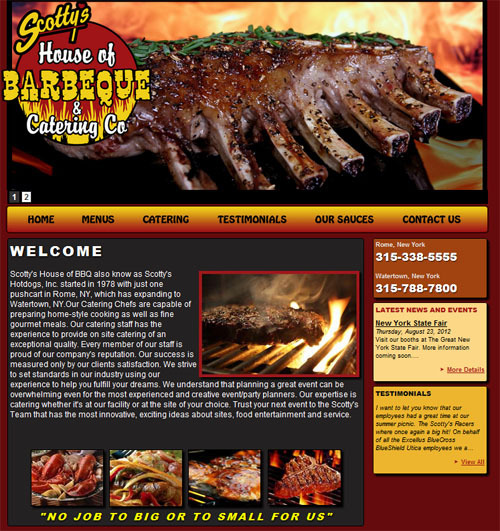 Scotty's House of BBQ also know as Scotty's Hotdogs, Inc. started in 1978 with just one pushcart in Rome, NY, which has expanding to Watertown, NY.Our Catering Chefs are capable of preparing home-style cooking as well as fine gourmet meals. Our catering staff has the experience to provide on site catering of an exceptional quality. Every member of our staff is proud of our company's reputation. Our success is measured only by our clients satisfaction. We strive to set standards in our industry using our experience to help you fulfill your dreams. We understand that planning a great event can be overwhelming even for the most experienced and creative event/party planners. Our expertise is catering whether it's at our facility or at the site of your choice. Trust your next event to the Scotty's Team that has the most innovative, exciting ideas about sites, food entertainment and service.